Pirates Of The Caribbean: At World's End's downloads quickly (aroung 15 second). The menu's setup is easy to follow, and the game is very intuitive. The game's menus and navigation setup could be tweaked a bit. It's a little annoying needing to select the language each time the game is played (instead of just once with a menu option to change it). There's also nothing to indicate that the "Host Liar's Dice" option is Single-Card Download, or even that it's the only option that is. A nice little mentipon on the screen would have been nice. The gameplay in Pirates Of The Caribbean: At World's End's Liar's Dice is pretty solid. Shaking the cup works (even if the dice inside the cup aren't animated during the shaking - specificly or genericly). Other than that, it's all tapping on arrows and buttons, so there's not much the game needs to maintain. The action isn't quick, but it is tight... and it works. Graphics aren't a huge concern in a dice game, but the look is solid. My biggest complain is that the dice don't move around inside the cup while it's being shaken. This isn't really a big problem (it doesn't effect the gameplay), but looks a little awkward. Why not at least include some generic movement (the dice don't need to instictively react to the way the cup is being shaken)? That's the biggest complaint about the graphics (i.e. no real problems). The sound is a nice background mix, not obtrusive, but not necessary (guests' Nintendo DS systems remain silent of music). Adding in the optional AI characters (at varying difficulties) to fill in empty seats keeps people honest. Liar's Dice is, quite simply, a dice game. There's no intense action, no time limits, and nothing to get in the way of the core gameplay. The game is drived directly from the Pirates Of The Caribbean films, which makes it not only a nice tie-in, but also an appropriate one. Too often, mini games make no sense or don't represent the main game's theme. The quick download times make this a good pickup-and-play game (assuming players don't drag their heels during the bidding and calling). One of the things I really appreciate about this game is the series of decisions the programmers made. They realized that the main game couldn't be played via Single-Card Download because of the space, but they wanted their players to be able to bring their friends and family into the Pirates Of The Caribbean game universe through Single-Card Download feature. They looked through the available material and spent time creating a quality mini-game for the feature. (You can also dual in multi-card play.) With the exception of Nintendo's Wi-Fi Connection, the programmers fully embraced Nintendo's philosophy of playing video games with others, and not always by yourself. The game is fun play. It's not so complicated that it will throw off casual gamers. It can even keep core gamers occupied for a while. This is one game I'll keep playing from time to time. Animate the dice while the cup is shaking. Allow for different types of dice (d4, d8, d10, d12, d20). Include skins for other Disney properties. Program an advanced mode that allows for more than (or less than) five dice at the start. 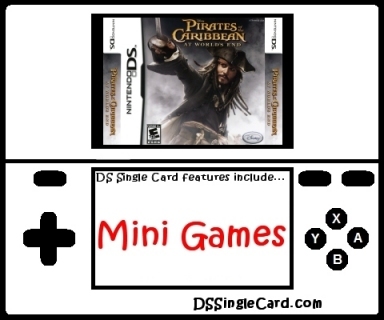 Click here to return to the DSSingleCard.com Pirates Of The Caribbean: At World's End profile.